Ultimate Medical Academy provides support throughout online education and healthcare career journey. Graduating from Ultimate Medical Academy is a dream come true! Ultimate Medical Academy is proud to highlight Shay Blanks, a resident of Charlotte, North Carolina, and a 2017 graduate of Ultimate Medical Academy's Healthcare Management associate degree program. After years of being a certified nursing assistant, Blanks aspired for more from her healthcare career. She knew it was time to make that jump to advancing her education online and called Ultimate Medical Academy. "Three years ago I had a dream of walking across the stage at graduation with my cousin and two years ago a friend I used to work with told me about UMA," Blanks said. "I talked to UMA and signed up immediately. I told my cousin about it [my dream] and we both enrolled and walked at graduation. It's a dream come true." 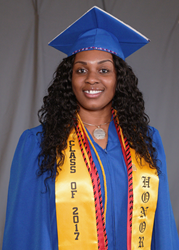 Blanks enjoyed her online experience and excelled while earning her associate degree at the nonprofit institution. "I am very happy I decided to attend UMA," Blanks said. "In the beginning I had no clue that I'd make straight As, I would be a 4.0 student, I would be on the Honor's Society, and that I would be an ambassador for the school. This was a great journey and I really enjoyed taking classes online." Blanks credits Ultimate Medical Academy’s Career Services with helping her prepare for interviews by updating her résumé and creating a cover letter. Her advisors helped Blanks interview for and secure a patient service coordinator III position with Novant Health in 2017. Based in Charlotte, North Carolina, Novant is a not-for-profit integrated system of 15 medical centers and 1,514 physicians in 529 locations. In her new role, Blanks is responsible for collecting patient demographics, insurance information, patient billing, and scheduling appointments. "I had great experience with Career Services,” Blanks said. “I actually still speak with them. They call and check on me…if there's anything they can help me with, they are willing. Career Services helped me land my job, prepare for my interviews and they even helped me pay for my first uniforms when I started at Novant." Blanks aspires to one day be a director, and eventually CEO, of a healthcare organization. Watch Blanks’ personal testimonial and graduation ceremony from Ultimate Medical Academy here. Ultimate Medical Academy is a nonprofit healthcare educational institution with a national presence. Headquartered in Tampa, Florida and founded in 1994, the school has more than 40,000 alumni and offers content-rich, interactive online courses to almost 14,000 students as well as hands-on training to hundreds of students. Ultimate Medical Academy students have access to academic advising, one-on-one or group tutoring, résumé and interview coaching, job search assistance, technical support and more. Ultimate Medical Academy is institutionally accredited by the Accrediting Bureau of Health Education Schools (ABHES). Learn more by visiting https://www.ultimatemedical.edu/.